MAKE THESE FUN EDIBLE GLITTER ICE CUBES! Hey there! I, Holly, am not afraid of glitter. While I try not to go overboard, I’m not afraid to make a mess and use it in my craft projects and even some of my baked goods. Edible glitter is the perfect topping for cakes, cake pops, chocolate candies and so much more to add color and sparkle. That’s when I thought, I just need a way to add glitter to my drinks now! Edible glitter ice cubes were the answer to adding some flair to any drink without changing the taste. Because edible glitter is essentially pure sugar, simply be aware that, depending on the amount used, it may increase the sweetness of your drink. I used my favorite silicone gem mold to create the ice cubes and then added the sugar. When added to liquid, the edible glitter slowly melts and changes the color of the liquid, which creates a pretty effect when using multiple colors. Because the glitter dissolves in liquid, it’s important to wait to add the glitter until after the water has frozen into ice. Otherwise, you’ll have colored ice cubes that are no longer glittery. Pour filtered water into an ice tray or silicone mold. Move to the freezer to solidify completely. Pour edible glitter into a small bowl. Remove ice from the molds and roll each piece in the edible glitter to coat. Note, it will coat easier if the ice sits out long enough to begin melting. This gives the glitter something to stick to. Rather than rolling each piece, you can also sprinkle the glitter on top. Then either add the glitter ice cubes directly to your drink or move to a bowl and return to the freezer until ready to use. Add multiple colors to your drink and watch as the colors dissolve into each other like a sunset. 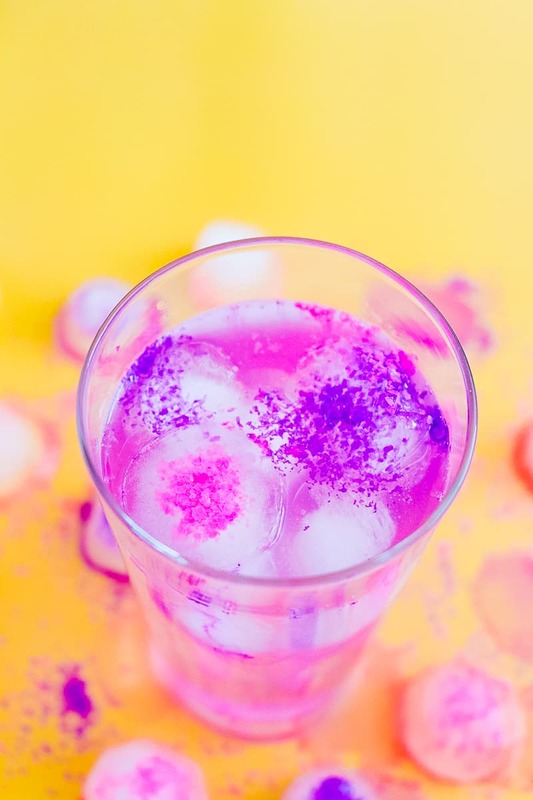 They’re truly easy to make but add some fun to parties by dyeing your drink fun colors with glittery ice. Who wouldn’t want that? !